See the Fully Restored, Screen-Used, Hero “A” DeLorean Time Machine from the Back to the Future trilogy! 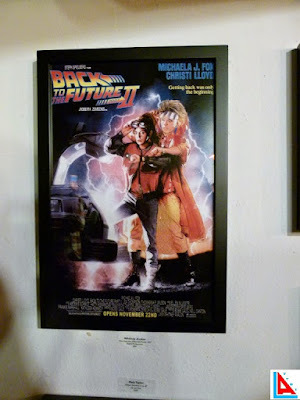 Enjoy a Screening of Back to the Future, Part II – with surprises! Actually ride on a Hoverboard with the gang! The original gang members are back, along with the original hoverboarding stunt team – this time with a much bigger rig! There will presentations, hands-on demonstrations and many opportunities to get celebrity photos and autographs! Later in the day, enjoy an evening under the stars with an Old West style BBQ dinner and a Screening of Back to the Future, Part III – of course with more surprises! We’re taking you BACK to all of the best filming locations from the Back to the Future Trilogy – with a few more surprises! Grab a Whopper at the Burger King filming location, next to Docs Lab! Then in the evening, embrace the future (or the past) in your BEST Back to the Future costumes! There will be fantastic prizes – and even more surprises! Saturday, October 24, 2015 “Enchantment Under The Sea Dance: Redux” featuring “The Flux Capacitors” 80’s Band! Once-in-a-lifetime Celebrity Auction of Back to the Future Screen Used props, memorabilia and collectables! We are BACK at the original filming location (United Methodist Church in Hollywood) for an even more epic recreation of the Enchantment Under the Sea Dance – you guessed it, with surprises! There will be many opportunities to get celebrity photos and autographs, and if they’re game – ask them to dance! Hors D’Oeuvres and Free Food Trucks! Think you’ve heard everything there is to know about the making Back to the Future? Think again! Original cast and crew will be your professors for the day! Original props will be on display along with never before seen production photos! After school, return to the scene of the Libyan attack for the final public screening of Back to the Future, Part 1 at Twin Pines Mall – with a couple more surprises!